Commute Seattle How Do You Get There, Seattle? According to a new survey conducted by Commute Seattle on behalf of the Seattle Department of Transportation, just 25 percent of commuters traveling into downtown Seattle are driving alone during the peak hours of 6 – 9 a.m. 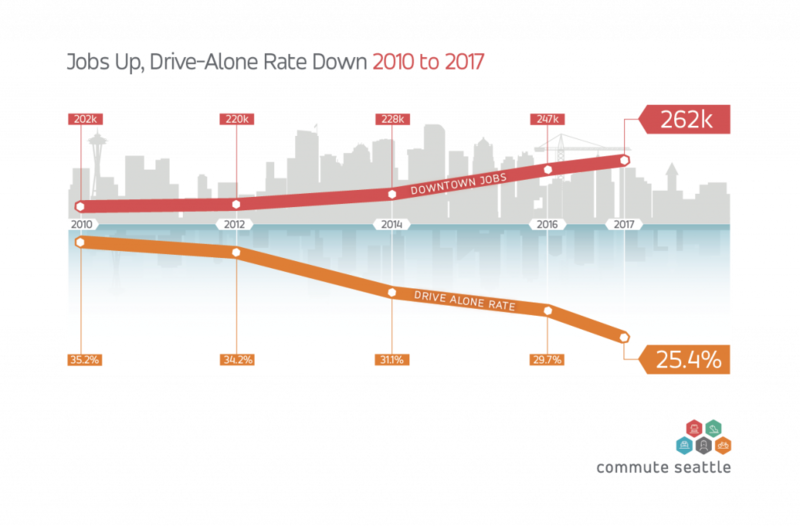 This is a drop of five percentage points in just one year, representing the best year-over-year reduction in drive-alone rates since Commute Seattle started collecting this data in 2010. 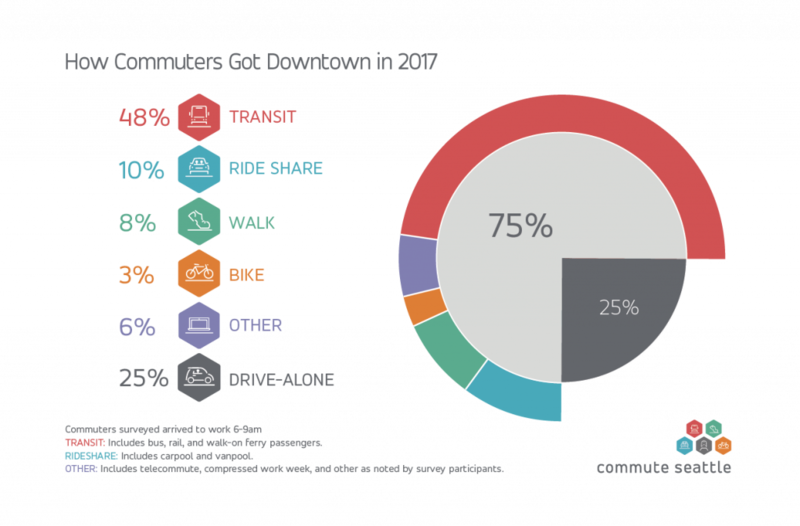 The 2017 Mode Split Survey shows that nearly half (48%) of downtown Seattle’s 262,000 workers are turning to transit for their daily commutes. 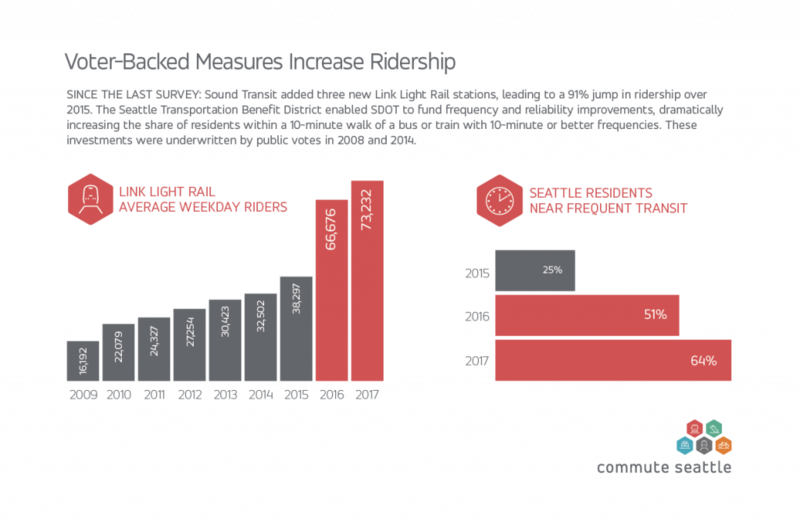 Overall, more than 75 percent of commuters are using a method of travel other than driving alone. Conducted by EMC Research, the Mode Split Survey studies the travel habits of thousands of downtown Seattle commuters across hundreds of companies. Included in the survey are large employers affected by the state’s Commute Trip Reduction (CTR) law as well as smaller businesses. 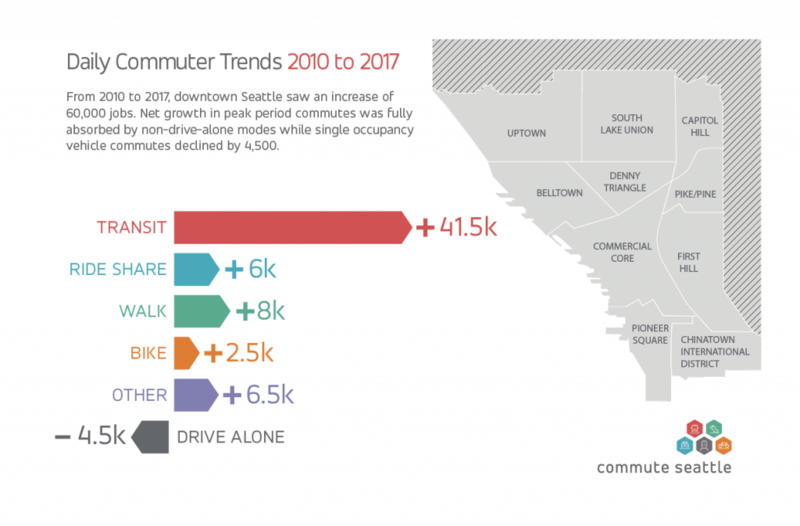 The survey has been conducted since 2010, providing detailed insights into commuter trends for transit, single-occupancy-vehicle (SOV), walking, biking, rideshare and other modes. Typically conducted biannually, the study was conducted in an off-year for the first time in 2017. Click here for 2016 Mode Split Survey Results. Click here for 2014 Mode Split Survey Results. Click here for 2012 Mode Split Survey Results. Click here for 2010 Mode Split Survey Results.